have evolved from the old lean-to greenhouses over the years. Originally they were viewed as an ideal alternative to conservatories for properties that did not necessarily have the space to build a full sized conservatory. Traditionally long and thin, the furniture had to be placed in a line rather than facing each other. The major difference between a sun lounge and a traditional period conservatory is the roof. 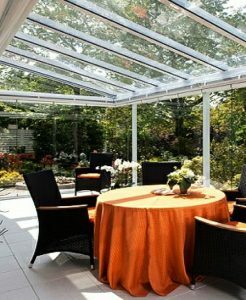 Whereas, conservatories have a glass roof, a sun lounge has a slat or tiled roof. The extensive glass windows remain the same. This difference in roof has several major consequences. The most obvious advantage is that sun lounges are much better insulated as the roof acts as a barrier to the sunlight in summer and helps retain the heat in the winter. Speaking from experience I can vouch for how a conservatory can exaggerate the temperature outside. One of the major expenses of conservatory, the conservatory blinds, has been removed with a sun lounge. The roof performs the major task of blocking out most of the sun and so there are just the windows to worry about. You will still need some protection as there is a good deal of light streaming still with the expanse of glass, but it is possible that curtains will suffice. Certainly, it is not as critical as with a conventional lounge. The conservatory is a transitional space between the indoors and outdoors and likewise the sun lounge. However, as we mentioned previously the sun lounge has greater insulation and there can be used all year round that much easier. So even if the elements make the conservatory just to expensive to heat, the sun lounge will still be available. Sun lounges come in many shapes and sizes and tend to built tailor made rather than come in pre manufactured sizes of the conservatory. Also, they are ideally suited to bungalows as they can be designed with low pitch roofs unlike the period conservatories, such as Victorian conservatories, where high-pitched apex roof is an inherent part of the design. Another difference between conservatories and sun lounges is the planning permission. Generally speaking conservatories do not need planning permission, where as sun lounges do. However, we must stress that we are speaking generally here and to be certain you should check with your local building authority. The reason for the difference is the roof.